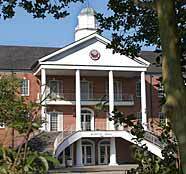 Students who miss the August 17 deadline to pay fees for the Fall 2004 semester at UL Lafayette can reschedule classes beginning at 4 p.m. Thursday, August 19. Students may use the ULink web portal at www.louisiana.edu to register or the telephone registration system. Fees can be paid at Coronna Hall on campus or by faxing (using Visa, MasterCard or Discover). The fax number is (337) 482-CARD for local dialing and 1-866-683-5288 (toll free) in the U.S.
To fax a credit card payment, please include your printed name, social security number, amount to be charged, credit card number, date of expiration and signature of card holder. For more information about fee payments, call (337) 482-6385.